When we talk about YHVH’s feasts or festivals, we sometimes think of big celebrations with lots of festive foods along with family and friends. Although some of YHVH’s feasts are meant to be joyous celebrations (such as Sukkot – the Feast of Tabernacles), others are meant to be more somber and introspective. Yom Teruah (literally the “feast of the blowing of trumpets (shofarot)”) is a combination of both joyous and somber emotions. In a previous blog (When Yeshua Returns), we have already dealt with the misconception that Yom Teruah is actually the Jewish new year, or what is called Rosh Hashanah (literally “the head of the year”). Yom Teruah marks the beginning of the seventh month on God’s calendar, so by definition it cannot be the start of the year. The Hebrew word used most often for YHVH’s feast days in the Scriptures is Mo’ed (feast) or Mo’edim (feasts plural). However, this word is much better translated as “appointment” or more accurately “divine appointment”. YHVH meant for these appointments to be holy (set-apart) times on His calendar to meet with Him. They were also called “Holy Convocations”, which in the Hebrew is Miqra, meaning an “assembly” but also a “Dress Rehearsal”. Whenever one of YHVH’s divine appointments arrives, we are supposed to look back and remember something that God has done for us in the past, but we are also supposed to look forward to what He will do in the future. In His Mo’edim, God has essentially given us a “roadmap” of the most important events in human history. 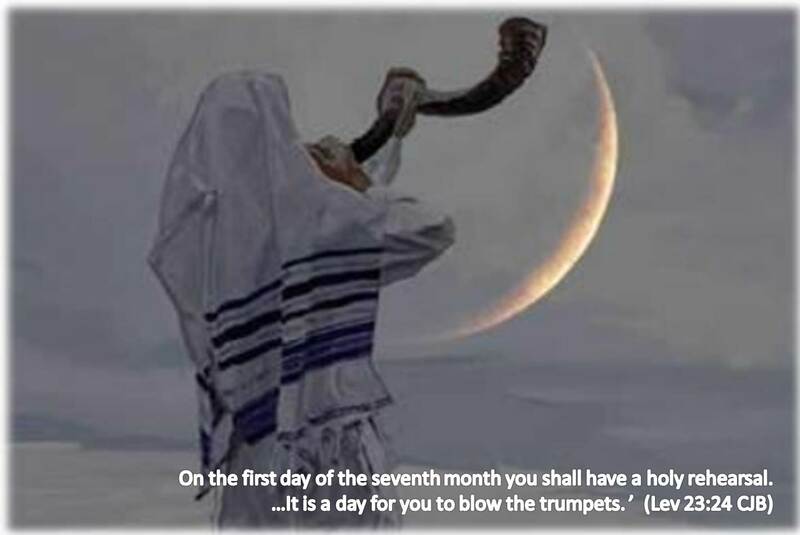 Leviticus 23:24 describes Yom Teruah in this way: “In the seventh month, on the first day of the month, you shall have a sabbath-rest, a memorial of blowing of trumpets, a holy convocation (rehearsal)”. Where it says “memorial” in this verse, another name is being used for the Feast of Trumpets – it is also called Zihk’ron Teruah which means a call for remembering through the loud blowing of trumpets. So what are we remembering from the past and what are we rehearsing for the future? By Jewish tradition and ancient calendars, it is believed that Yom Teruah commemorates the first day of Elohim’s Creation of the universe. This fits with God’s biblical calendar. When the Israelites were delivered out of Egypt, YHVH then said to them: “This month shall be the beginning of months for you; it is to be the first month of the year to you” (Exodus 12:2). This was of course the first day (new moon) of the Passover month (Aviv), which had been their seventh month but was now their first month by God’s instruction. Thus we know that the seventh month (Ethanim) had been the first month on God’s calendar, which is the calendar He created for us at the time He created the world. We can give thanks to Yehovah Elohim on Yom Teruah for creating the universe and us as His children. As far as rehearsing the future on Yom Teruah, we need to look to the verses where the shofar blast is described as a warning or announcement of a future event. There are a number of Scriptures where we see the shofar being blown as a call to repent and turn back (teshuvah) to YHVH, warning us of the God’s great judgment at the end times, in the “Day of the LORD”. (Joel 2:1, Zech 9:14, Rev 11:15) In Matthew 24, Yeshua tells us of the great shofar blast when He comes in judgment and to gather His remnant together from the whole Earth: “And He will send out his angels with the mighty blast of a trumpet, and they will gather His chosen ones from all over the world—from the farthest ends of the earth and heaven”. Abba, as we are celebrating your appointed time to be with You on Yom Teruah, help us to remember all that You have done for us in the past, including the great sacrifice of Your Son for our salvation and deliverance. Help us to also look ahead at what You are going to do in the future, and make sure we are prepared like the wise virgins who had an abundance of oil for their lamps. We want to be a part of Your remnant, pleasing to you and prepared in our hearts and spirits to receive Your blessing when You return to this Earth to reign and rule.